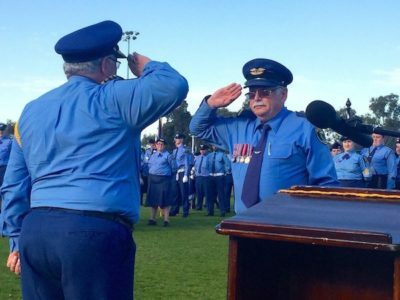 At the recent NSW Group Review, NSW Boys’ Group Commissioner Raymond McKenzie was honoured with the Australian Air League’s highest honour – the Award of Life Membership by Chief Commissioner Ian Rickards. Ray McKenzie joined the Australian Air League Blacktown Squadron in 1955 and made steady progress through the ranks to the position of Drum Major with the band, winning many competitions. In 1961 he became an Officer with the Squadron and held a number of appointments with the Squadron including Squadron Officer Commanding from 1985 through to 2005. Among the many highlights of his time as Squadron OC were the construction of the new Squadron hall at Blacktown in 1988 and being acknowledged in Federal Parliament by Federal Member for Greenway Louise Markus MP for the work of the Squadron in 2004. As well as his role with Blacktown Squadron, Ray has held a number of other appointments with the Air League including NSW Boys Group Band Officer, Officer Commanding Kerr Wing, as well as Group Administration Commissioner, Group Operations Commissioner, Group Chairman and Group Records Officer. Ray is also a branch committee member for Blacktown Squadron and previously Penrith Squadron. He was a member of the Future Committee during the production of the League’s updated Memorandum and Articles of Association and also a past Councillor on the Council of the Air League. Ray has also been a keen supporter of NSW Girls Group and his wife Robyn, the NSW Girls’ Group Executive Commissioner providing assistance at Athletics and Swimming Carnivals, Training and Recreation camps and undertaking instructional roles to pass on his knowledge of the League. Each ANZAC Day the Australian Air League has assisted the Air Force contingent of the Sydney ANZAC Day March and Ray has worked tirelessly for many years with the RAAF Association co-ordinating these events. Group Commissioner Raymond McKenzie has excelled as a fine example of a loyal and respected NCO and then Officer of the Australian Air League for 60 years and the Award of Life Membership is a fitting and just reward to a member who has given so many years actively serving the Australian Air League and the youth associated with it.